I had a hard time deciding what I wanted to do for my Day of Reflection. Last year was my first year here at PRA, and I have never done anything like this at my previous company, so I wanted to make sure it was meaningful. I thought about all of the suggestions I received, such as getting a massage or taking a hike but I still found myself hemming and hawing about it. My Area Director, Lisa, sent out an email about a museum she went to, and I immediately thought about the National Museum of African American History and Culture (NMAAHC). It took some doing but I was finally able to secure tickets and off I went! My ticket time wasn’t until 3:00 p.m., so I needed to find something to do fill my time until then. I ended up checking out the International Spy Museum and the Martin Luther King Jr. Memorial. 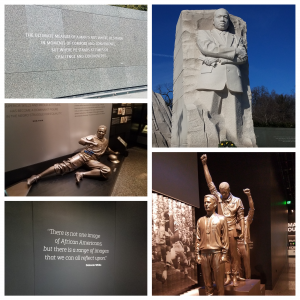 Both were interesting in their own right, especially the MLK Memorial but neither compared to the NMAAHC. On the ride over, the Uber driver told me the shape of the museum was modeled after the crowns of African women. I can neither confirm nor deny this fact but if this is an accurate fact I think that makes the museum even more interesting. I started my tour at the café on the bottom level—I had been up since 3:00 a.m. and was starving, don’t judge me! Their menu was AMAZING, but besides the food, the bottom level is where the journey begins. It starts from early 1400s and delves deep into slavery, what happened during that time, and how millions of people endured it. What struck me was how many people killed themselves rather than face the harsh reality of what their lives were about to become. As you move up through the levels of the museum, the events are laid out in chronological order. I did make it through all four levels of the museum but I did not get to see all of the exhibits. The museum is huge and requires more than one trip if you want to fully absorb everything. My favorite exhibit was the dance exhibit! I was in my element! 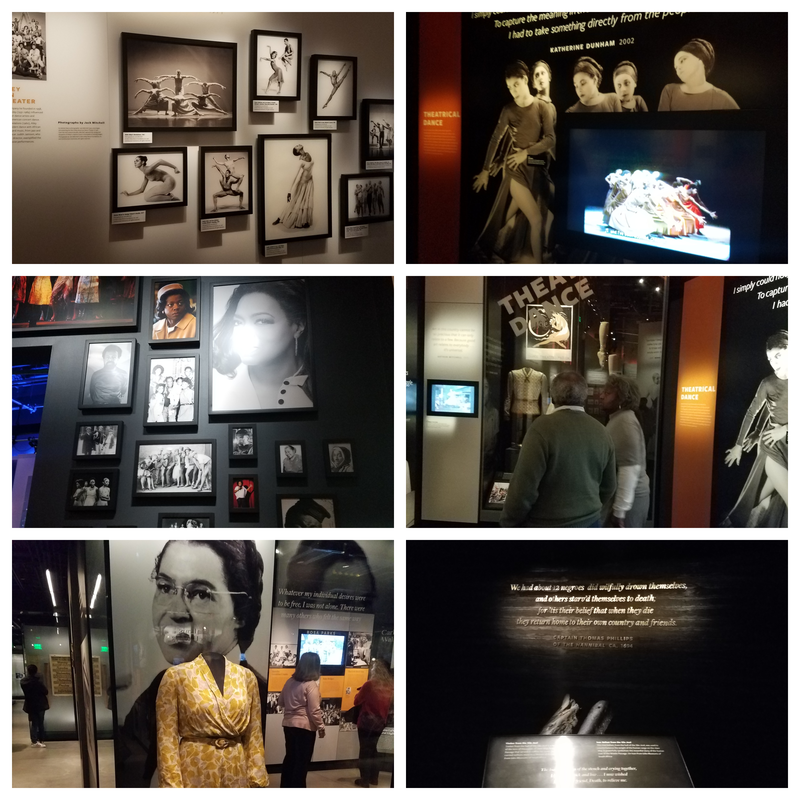 Learning about all of the most influential African Americans in various styles of dance, from theatrical dance to ballet to hip hop, I felt like that exhibit was made for me and was my temporary happy place. I needed that brief moment of calm because one thing the museum does offer is a non-edited view of the horrors African Americans have faced. There were various pictures of lynchings, beatings, and just out-right cruel torture that was endured. It made sad, angry, and every other negative emotion you could think of. How can the color of my skin be so offensive as to incite such violence? So yes, the dance exhibit brought me some much needed peace. 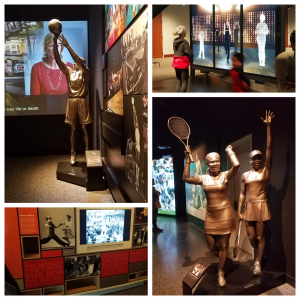 As I moved further up the museum, I was able to reminisce back to my childhood. There was an interactive section where you could learn how to step, where the moves were shown on a large screen and anyone could join in. Being part of the team was my most memorable middle school experience until my school decided to disband the step team and create the more main stream version…cheerleading. Yes, everyone I was a cheerleader…shhh, don’t tell anyone else. That exhibit brought me back to the nights where I would practice endlessly to get it perfect, to the competitions we won, the competitions we lost, and everything in between. 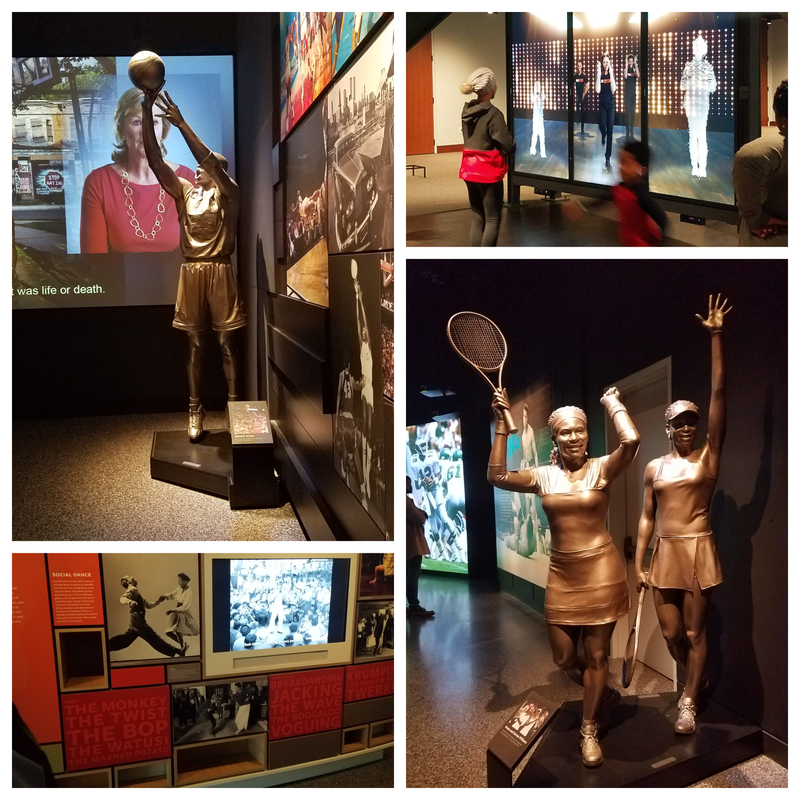 Step is part of our culture and I was happy that they thought of a way to not only include it in the museum but to make you be a part of it. Thanks for sharing. I experienced similar emotions when I visited the museum last year. I too experienced a wide range of emotions as I moved through time from exhibit to exhibit. I had my most intensive feelings as I walked through the exhibits on the Middle Passage. Perhaps millons of Africans threw themselves into the Atlantic Ocean rather than live in a strange land as slaves. My African ancestors made an arduous journey from the coast of West Africa to the Americas. I shed tears for their suffering but shouted for joy that they had the strength and faith to survive otherwise I would not be here.